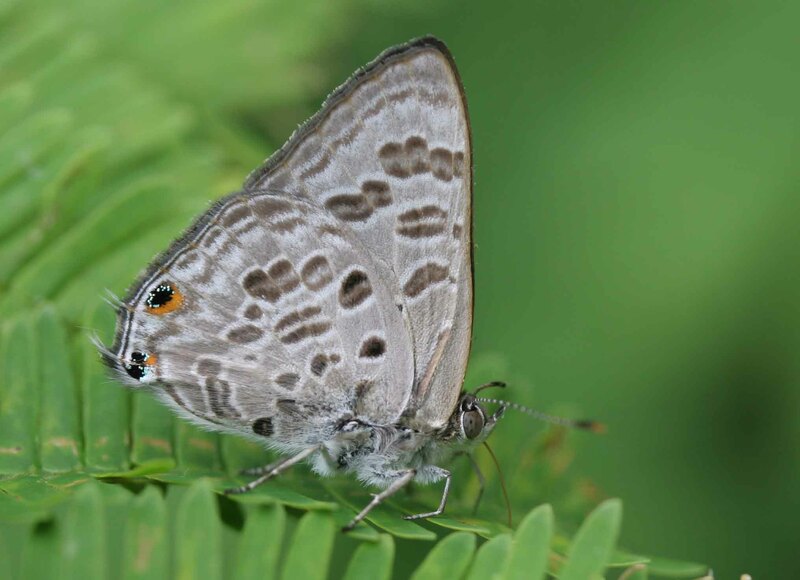 Custodians of Rare and Endangered Lepidoptera (COREL) is a joint LepSoc Africa–Brenton Blue Trust project to secure the survival of our threatened butterfly and moth species. During the SABCA project 61 taxa were identified as threatened in terms of the IUCN (2010) categories and criteria. Drawing inspiration from SANBI’s successful Custodians of Rare and Endangered Wildflowers programme, LepSoc Africa decided to launch a programme called COREL (Custodians of Rare and Endangered Lepidoptera), to promote and ensure the conservation of all butterflies and moths Red Listed as threatened in South Africa. This programme was adopted unanimously by the trustees of the Brenton Blue Trust, which is now funding the project. COREL initially focused on the Critically Endangered (CR) butterfly and moth taxa, of which there are currently 15, including the moth Callioratis millari. CR taxa are at imminent risk of extinction, and five of these were assessed as being possibly extinct during SABCA. For each CR taxon LepSoc has identified one or more custodians who have agreed to take the primary responsibility for monitoring and preventing extinction of the taxon. The COREL programme has now been expanded to include some Endangered, Vulnerable and Data Deficient butterflies and moths, whenever volunteers come forward. In 2013 this butterfly’s remaining last population in Cape Flats Dune Strandveld was imminently threatened by a road widening project right through its habitat! 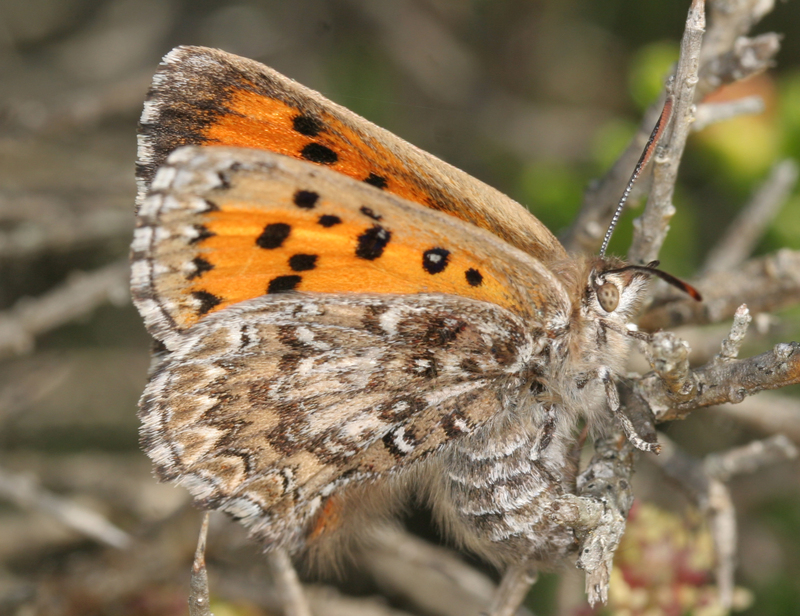 In October 2013, however, Mogamed Samsodien of the Pelican Park section of the False Bay Nature Reserve(FBNR) and Andrew Morton of LepSoc Africa discovered two populations of this critically endangered butterfly within this nature reserve. This was a game changer, and another FBNR employee Ismat Adams became so interested in the butterfly that he enrolled at UCT to do an MSc on the species. His research has subsequently revealed many fascinating facts about the butterfly and its habitat, which should enable us to manage the habitat better and make the species secure. This butterfly was first discovered in 1858, but not seen again until it was rediscovered at Nature’s Valley in 1977. Unfortunately, the butterfly disappeared from Nature’s Valley by the late 1980s, as more and more houses were built there. The colony at Brenton-on-Sea was discovered in November 1991, but since it was on land proclaimed for development a prolonged campaign to persuade government to purchase the land eventually succeeded in 1997, and a butterfly reserve was proclaimed. This is now the only known remaining place where this butterfly still occurs, despite intensive searches by many lepidopterists. Currently there are plans to expand the original reserve to ten times its size so that the butterfly population can be made sustainable. More information can be found on the official Brenton Blue website. 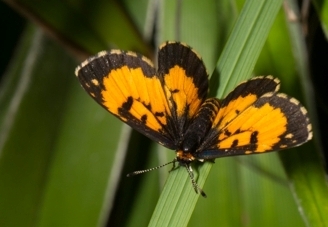 This butterfly was originally found on the Cape west coast between Melkboschstrand and Mamre. Its last known colony in the area was near the Pella Research Site, where eight sub colonies were located over an area of 60ha. It disappeared from these habitats in the mid-nineties, for reasons unknown. A population found in 1979 at Witsand over 200km from the type locality also seemed to have disappeared, but fortunately further populations were discovered not far from Witsand by Ernest Pringle after an extensive search. The colonies near Witsand occur on Canca Limestone Fynbos (Mucina & Rutherford 2006 FFl3), on fairly level ground where limestone pavements outcrop. The vegetation is predominantly restioid with a sparse low shrub layer and patches of bare rock and sand. There is light grazing by cattle and game. The population of adults has been known to fluctuate widely, but the localities are well-protected. A research programme over the last seven years has been yielding insights into the ecology of the butterfly, with two papers recently published in Metamorphosis. CapeNature and Stellenbosch University (the landowner) have agreed upon creating a 1200 ha nature reserve, including some of the strongest colonies of the butterfly, so its future looks increasingly secure. CN have commenced a systematic alien removal programme across the 60 ha where the butterfly colonies occur. 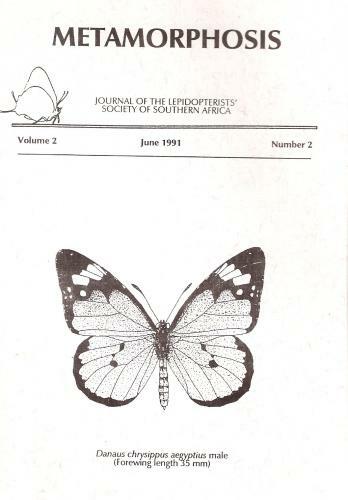 This butterfly was originally known only from the type locality at Manoutsa Park below the Strydom Tunnel in the Abel Erasmus Pass in Limpopo, where it had not been seen since its discovery. 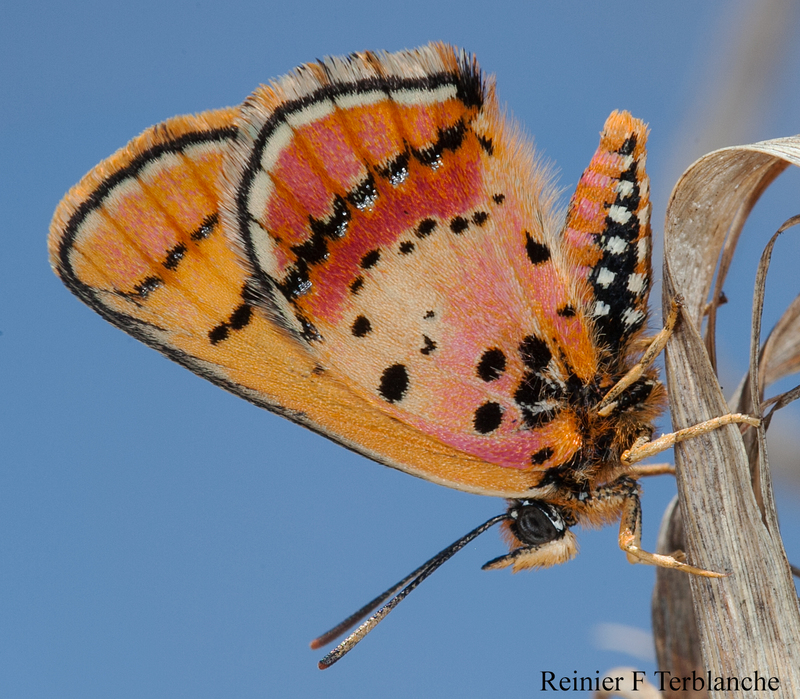 During 2011, Mark Williams found it in numbers at Lekgalameetse Nature Reserve and this locality has since been visited by other lepidopterists confirming that a strong colony exists there. This may ultimately lead to a revision of its "Critically Endangered" status, since it is secure in a nature reserve. In November 2012 Reinier Terblanche relocated a male and a female at Manoutsa Park, and in 2013 Andre Coetzer and Alan Gardiner described its life history and confirmed that its host plant was Acacia polycantha. 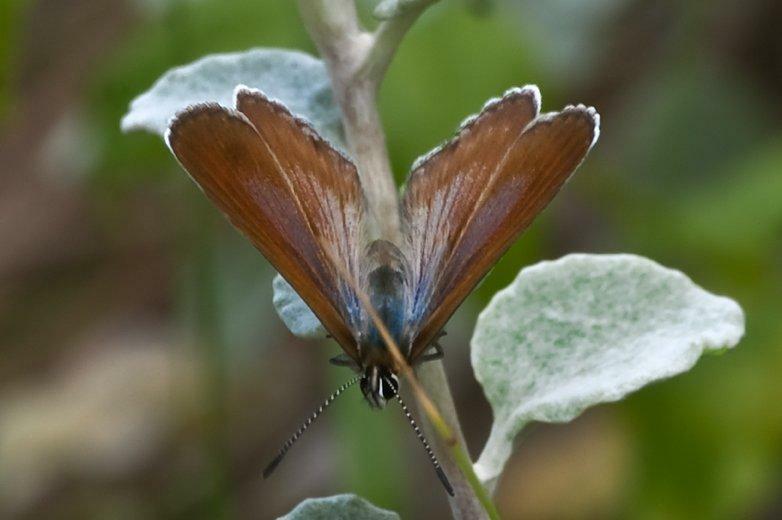 This butterfly was originally very abundant around Knysna, but became very rare due to its very narrow habitat specificity and the loss of suitable habitat on the eastern Knysna Heads. The number of colonies and the population trend has been steadily declining since the 1960’s and this has accelerated since 1980. Building activities on the eastern Knysna Heads destroyed many strong colonies until the last one was destroyed when a house was built on the exact centre of this colony. In 1996 a strong colony was found on a proposed golf estate development, but despite the developers being fully aware of this, it was exterminated by the building of the access road in 1998. Other small colonies on the hills of the Woodbourne farm were eliminated by the change from cattle to sheep grazing in the early 2000s. Other small colonies were destroyed during the building of the golf course, leaving just one colony below the sixth fairway of the golf course, but the property owners are not prepared to manage the site for the butterfly, which would involve reintroduction of cattle grazing and occasional burning of the fynbos. Fortunately LepSoc Africa members have rediscovered a strong colony near Coney Glen beach near sea level, and subsequently two more coastal colonies have been found. The inland (fynbos) colony is still in need of saving because of the striking difference of the two habitats. This is one of a few species of ancient moths that can be regarded as living fossils called the diptychines, all confined to Africa, with cycad host plants. Callioratis millari is the most threatened of the Callioratis species, disappearing from its type locality near Kloof c. 1928. It had not been seen for over 75 years despite efforts by Hermann Staude, Neville Duke, Alf Curle and a media campaign to try and relocate it. It was regarded as extinct until a specimen was found by Glen Holland, the local conservator at Entumeni Nature Reserve, some 120km from the type locality, in 1997. It is now known to use the Natal Grass Cycad Stangeria eriopus as host-plant. In recent years, adults and larvae of C. millari have only been found in two open grassland patches surrounded by coastal scarp forest (on one side a gravel road) within the boundaries of the Entumeni Nature Reserve and on a small wet patch, surrounded by drier grassland, nestled against a hillside on private land. These grassland patches support a good number of low growing Stangeria eriopus plants. No other cycads occur in the grassland although both S. eriopus and Encephalartos villosus occur under the surrounding forest canopy. Adults of C. millari have only been seen to fly within the confines of the two grassland islands at Entumeni. It appears that the range of C. millari is restricted to this grassland habitat and that it will only breed in the grassland in spite of plentiful available foodplant under the canopy of the surrounding forest and in grasslands at lower elevations. 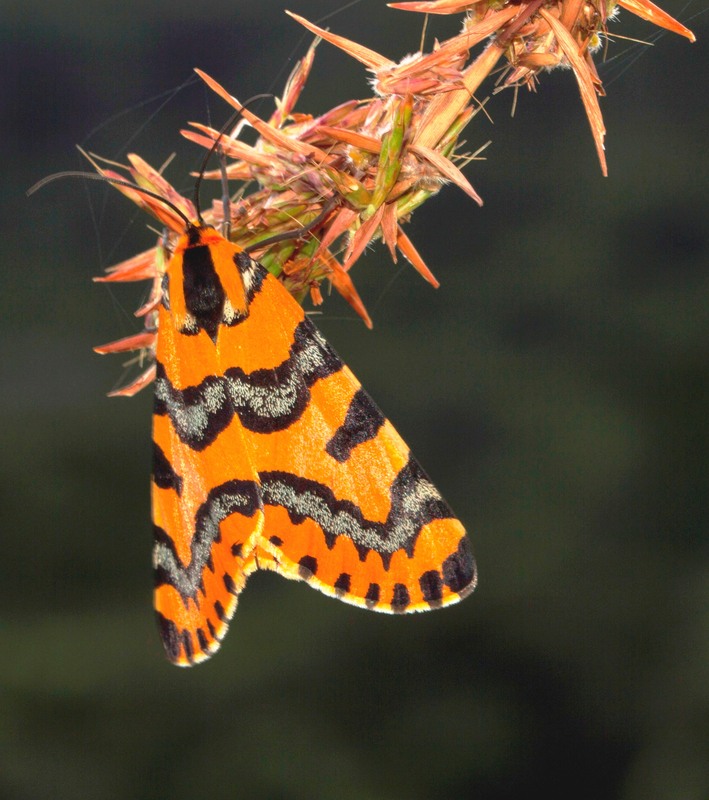 Ezemvelo KZN Wildlife have been enormously supportive of LepSoc Africa’s efforts to conserve this critically endangered moth, and have for over a decade been doing egg and larval counts at all the places where C. millari adults or larvae have been seen. During the last few years research efforts have intensified to discover more about the ecology of C. millari, particularly where the larvae go to after the second instar. This species was originally discovered on Paarl Mountain overlooking Paarl, but is almost certainly extinct there now, owing to severe alien vegetation invasion and too frequent fires in summer/autumn. It was until ten years ago known to occur on the Paardeberg mountain about 20 km northwest of Paarl, where there were two small colonies, each less than 1 ha in size, and about 1 km apart. Annual searches by the custodians Andrew Morton and Fanie Rautenbach have failed to find it again on Paardeberg and is now considered to be under severe threat of extinction. Continue population monitoring and revisit the type locality. Search for more localities using Google Earth to focus searches. Describe the Dindela and type localities (climate, vegetation, aspect, geology, other invertebrates) to improve understanding of the ecology of the butterfly. Try again to raise the species from ovum to adult. Identify possible threats at Dindela such as grazing and fire regimes. 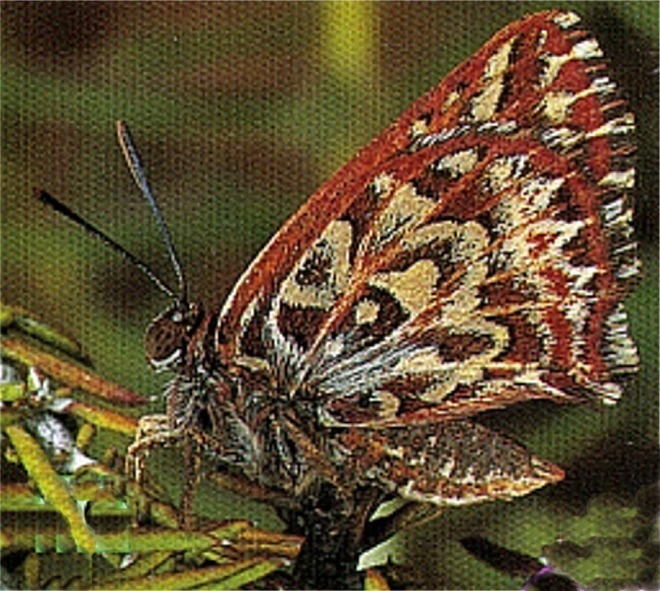 On 2 March 2013 this butterfly, feared extinct for some 20 years, was rediscovered at the Bateleur Nature Reserve in the Waterberg by Mark Williams. Since that time, with the cooperation of the landowner Wouter Schreuders, a comprehensive research project has been undertaken by Reinier Terblanche, leading to a recommendation for a carefully planned burn at the habitat of E. edgei. This burn was accomplished during August and the expected proliferation of the butterfly’s host plants Gnidia kraussiana and Gnidia microcephala has taken place. A bumper season for the butterfly was expected, but probably due to the effects of the drought in this part of the country few butterflies were seen. In January 2013 Haenertsburg botanist Sylvie Kremer-Köhne sent André Coetzer a photograph of a butterfly taken while photographing wild flowers. It was a female Wolkberg Zulu, and it had been found about 10 km southeast of the original locality, where the butterfly had become extremely scarce. Several visits to the new locality by LepSoc Africa members soon confirmed that it was indeed present in numbers. Regular visits to both the new and the old locality subsequently have yielded good monitoring data on the adults, and the life history has been discovered and described by the custodian André Coetzer.